This year, we’re thrilled once again to join with REI, the outdoor equipment co-op to encourage you to opt outside on Black Friday. REI gives its employees a paid day off instead of opening for the crush of people looking for deals the day after Thanksgiving and encourages other organizations to do the same. They also started the #OptOutside hashtag as a way for people to share what they’re doing in nature. We love the idea of #OptOutside because it matches so wonderfully with our Core Values, specifically that we want children to “experience the awe of nature.” We hope that you’ll join with us in spending time outside on Friday, November 23rd. If you take pictures, you can share them on social media using the hashtag #OptOutside. We’d love it if you also tagged us (@goldarrowcamp) so that we can see what you’re doing outside. We’ll share our favorite GAC family #OptOutside pictures on our social media channels. 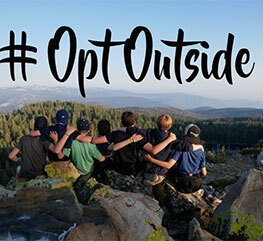 If you’d like more information on the Opt Outside movement, visit REI’s Opt Outside website.